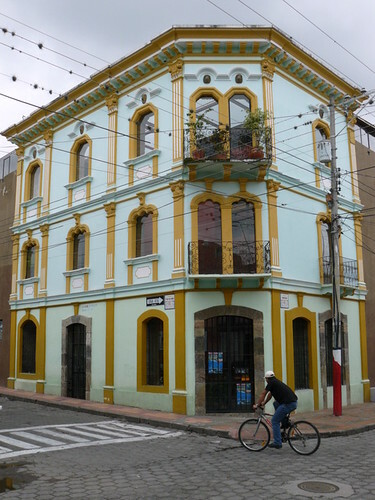 One Cotacachi property that has an interesting past and present is the Casa de Cultura (Culture House). This is just round the corner from Meson de las Flores and captures the attention as you walk down Bolivar Street. Now it looks like this below. 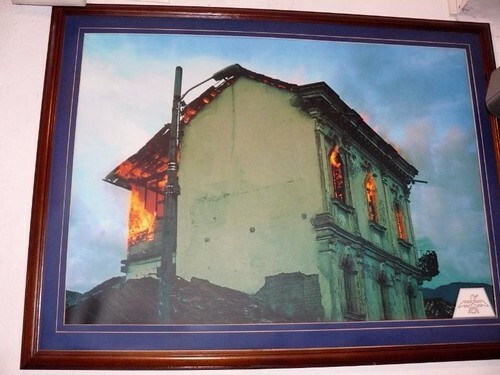 A picture on the wall of the new building shows the old building gutted in a fire on that date. It had been the tallest Cotacachi property just ten years ago and was built in an architectural style called Republican neo-classical. It had been abandoned some 8 years before the fire when the elderly owners passed away. Then somebody had secretly entered it to make it a home with a view. The fire started on the top floor most probably from a candle that tipped over. 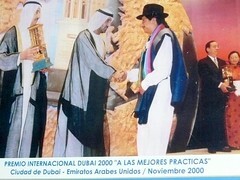 Auki Tituaña, the Cotacachi mayor received the prize in Dubai. … and two years later UNESCO awarded Cotacachi the ‘City of Peace’ award for promoting much improved relations between the different races here in this county. 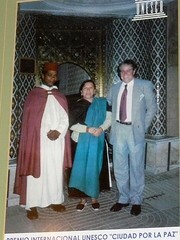 The UNESCO award ceremony in Marrakesh, Morocco. This Cotacachi property, the Casa de Cultura was built based on the goodwill generated by the efforts to improve relations between the indigenous people and the mestizos – there had often been mis-understandings of different cultures before and mostly it was to the disadvantage of the indigenous people. The fire had gutted much of the building but it was decided by the architect employed by the municipality to build with the remains and integrate old with new. The walls on the outside of the building are 33 feet tall and built using brick and rammed earth – just how many indigenous houses get built. For added strength they are 4 and a half feet wide! Here you can see where rammed earth is used in the areas of the wall that bear less load. In Ecuador a communal work effort is known as a minga. 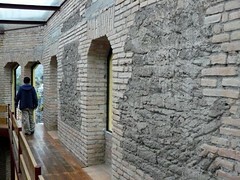 The Casa de Cultura was resurrected using the efforts of all the local indigenous communities. There are dozens of communities in the countryside around Cotacachi and each community took turns to send as many as 40 workers for a few days. They were given food but worked for free. The idea was for the indigenous community to associate with the building as a center for them and not just the ‘rich’ townsfolk. The idea of this Cotacachi property is that it provides a space for interraction of the community and support of the community. It’s purpose is to help different factions of society and yet pull them all together too. 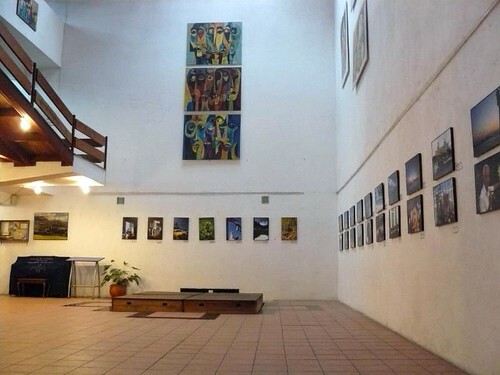 and in general the large open space on the ground floor is used for exhibitions and seminars. 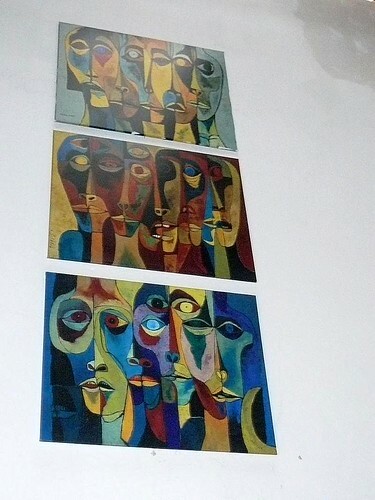 But this is also and education center as well as a social arts center and even a tourist center. 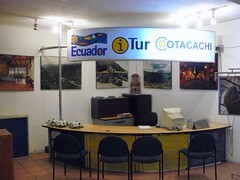 Here you can find out much about tourism in the county of Cotacachi as well as even receive free help should anything go awry with your tourist visit ( unlikely in my opinion – but useful to know ). When I visited yesterday these students below were studying an online classroom at the Ibero-American Virtual College based in Quito some 2 hours distance away. 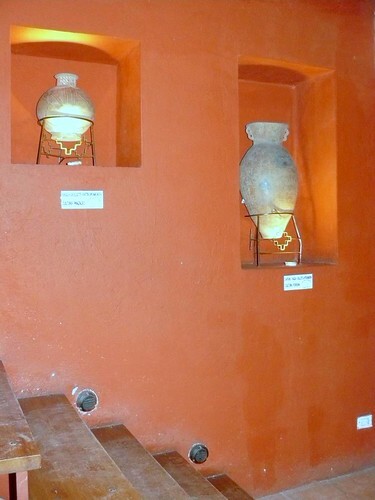 Urns from the Panzaleo and Puruha pre-Colombian cultures .. from central Ecuador. 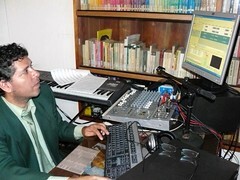 Next to the students the municipal musical director uses a mini digital music studio to transcribe music to song sheets that the Cotacachi band or Cotacachi Choir will later learn to play and sing. 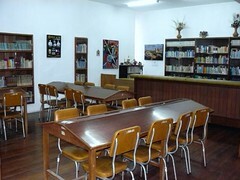 Besides this classroom is the Casa de Cultura library. Modest but well organized and laid out to help students study. They lack room so some of the books are in store-rooms below. 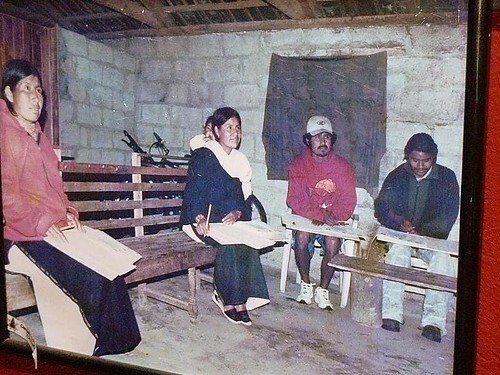 But perhaps the most remarkable achievement of the folks who run this Cotacachi property was to virtually eliminate illiteracy in the county of Cotacachi. Many indigenous couldn’t see never mind try to read. 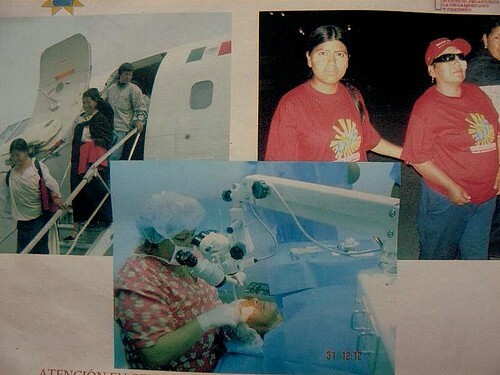 The mayor used his influence and contacts within Ecuador and outside to arrive at an agreement with Venezuela – free eye operations for all that needed them to remove cataracts and the like. Pictures in one room tell the proud story of how within 18 months illiteracy was reduced from 23% down to 3.9% of the population. and how intense effort was needed on the part of the adults who needed and wanted to learn too …. 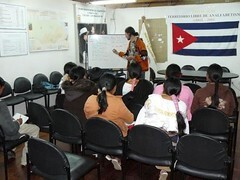 There is always a way to get involved in society in Cotacachi or elsewhere in Ecuador. The needs are so great. Land of the Sun, Gary and Merri’s foundation, has been set up to help the indigenous people and also to help others such as you in your efforts to help too. 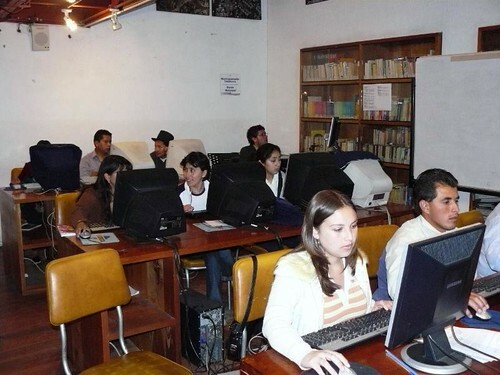 We offer employment, learning opportunities, social help such as feeding the frail and elderly, give to other Ecuadorian foundations, and have sponsored a number of cultural events too. Needs are great but it’s gratifying to see the Casa de Cultura, a Cotacachi property built with the sweat of the indigenous volunteers in mingas, able to help those same indigenous people learn how to read and write. Ecuador has a rich culture past and present – it’s our pleasure to be able to show you it.